First Line: The desert glowed in the dawn light. 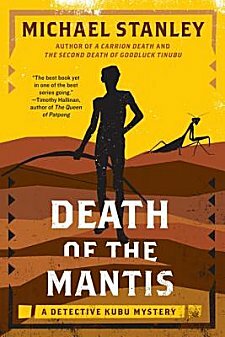 In this wonderful third entry in the Detective Kubu mystery series set in Botswana, Detective David Bengu (call him Kubu, please) finds himself torn between the orders of his superior officer and the request of a beloved childhood friend. As little boys, Kubu and his Bushman schoolmate Khumanego are the ones who are "different"-- the outsiders. As a result, they became close friends. Once they left school, however, they lost track of each other, so when Kubu first sees his old friend, he is overjoyed. Khumanego has become an advocate for his people, and he believes that the incarceration of three of his fellow tribesmen shows racial motivation on the part of the local police. When a second, and then a third, murder occurs in the same area-- both pointing to the nomadic Bushman tribe-- Kubu's superior changes his tune and lets the detective go to investigate. When Kubu arrives and begins to piece clues and facts together, he finds himself on what may well turn out to be a one-way trip into the unforgiving Kalahari Desert. The writing team of Michael Sears and Stanley Trollip have outdone themselves. I was held captive by this book! The descriptions of the Kalahari Desert reminded me of journeys my husband and I have taken out into the desert here: the vastness, the immensity of the sky, the seeming emptiness, the heat, the sun...the sense of being the only people on the face of the earth. Temper that with Kubu and his wife Joy adjusting to life as the parents of a demanding little baby, and you have a book that covers a lot of territory and a lot of emotions-- and covers them all very well indeed. I welcomed learning some of the legends and customs of the Bushmen, but for me what was foremost was the story itself. Sears and Trollip have written a compelling mystery with a tightly woven plot and excellent misdirection. Just as I became convinced I knew whom the killer was, I'd be proven wrong and given another false set of coordinates for my GPS-- and away I would go. I finally realized the killer's identity and still hoped I was wrong. When Kubu's investigation led into the depths of the desert, I became anxious for his safety. As I said, I was completely caught up in this book! Do you need to read the other two books in the series before reading this one? No, you don't. Personally I think you're a bit touched if you want to miss a single chapter in the life of one of my favorite detectives! This sounds like another marvelous series! I would enjoy the setting of this one too. Kathy-- It's a very good series. Too bad you didn't win the giveaway!